Of all the political prisoners transported to Van Diemen's Land, the Irishmen who led the Young Ireland nationalist movement in a failed rebellion against English rule in 1848 were among the most famous. These men of energy and intelligence met their transportation with dignity and in their different ways adapted to their new environment. But they were young men — at 45 the leader, William Smith O'Brien, was the oldest — and they never saw Van Diemen's Land as their final resting place. They hoped to serve Ireland in the future. 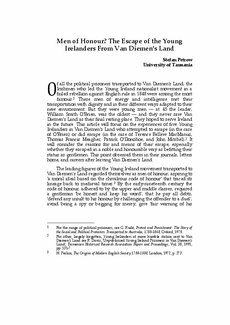 This article will focus on the experiences of five Young Irelanders in Van Diemen's Land who attempted to escape (in the case of O'Brien) or did escape (in the case of Terence Bellew MacManus, Thomas Francis Meagher, Patrick O'Donohoe, and John Mitchel). It will consider the reasons for and means of their escape, especially whether they escaped in a noble and honourable way as befitting their status as gentlemen. This point obsessed them in their journals, letters home, and careers after leaving Van Diemen's Land.